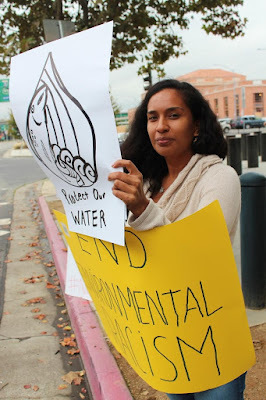 Liliana Mendoza (Maya) stands in front of federal building in Sacramento at a protest in solidarity with the Standing Rock Sioux. Photo Copyright by Francisco Dominguez. The Sacramento Area Friends and Relatives of the Lakota Nation sponsored a peaceful and indigenous faith-based event protest from 3 pm to 5 pm at the federal building at 501 I Street in Sacramento in support of the Standing Rock Sioux. "The situation at Standing Rock has escalated to the point that all people who support human rights, human dignity and the inherent rights of Mother Earth to live and thrive must take a stand,” said Francisco Dominguez (Tarahumara). 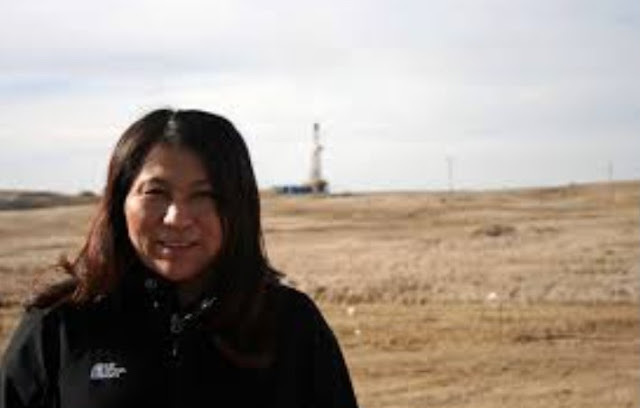 “The violence perpetuated by the state of North Dakota against the Lakota people and its allies is a moral disgrace." On October 4, the City of Davis, California passed a resolution declaring their solidarity with the Standing Rock Sioux Tribe’s opposition to the Dakota Access Pipeline. Davis joins many other cities across the country, including Seattle, Saint Paul, Minneapolis, Berkeley, Santa Barbara, Oakland and Sitka, Alaska, in opposition to the pipeline. Carol Standing Elk, Francisco Dominguez, Juliette Beck, Lynn Nettler, Becca Paine and Nick Buxton led the successful campaign to work with the City Council to pass the resolution.The resolution declares: “WHEREAS, the City of Davis has worked diligently for many years to secure and protect our own sustainable clean water supply and supports the Standing Rock Sioux Tribe in opposing the construction of the Dakota Access Pipeline that passes under the Missouri River and other water water sources with the recognized threat of contamination of existing clean water supplies with potential future oil spills. 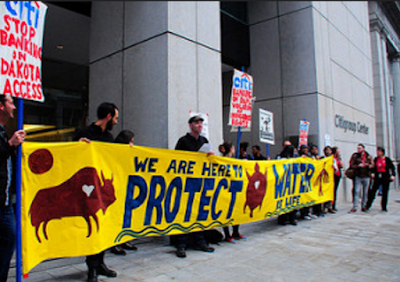 San Francisco, CA- Early this morning, 12 people were arrested in a daring occupation of the Citigroup Center lobby in San Francisco’s Financial District. The occupation demanded that Citibank, one of the largest funders of the Dakota Access Pipeline, stop financing the highly destructive project. The action comes in direct response to the crackdown by North Dakota law enforcement of protest camps blocking the construction of the Dakota Access Pipeline where 141 were violently arrested on Thursday. The Dakota Access Pipeline has made international headlines in the past month as thousands have gathered in encampments along the Missouri River to block construction of the 1,100 mile-long pipeline. The pipeline would carry fracked-oil from the Bakken shale fields of North Dakota through 4 states to Patoka, IL for dispersal to several different pipeline systems for eventual refining and overseas export. The effort has reported over different 100 tribes represented at the camps. The pipeline threatens the Missouri River, an important source of water for the Standing Rock Sioux. Citigroup is a lead arranger and lender to the project. In August, the bank arranged for a $2.5 billion loan to the collection of oil companies building the pipeline. Along with Citigroup, Bank of Tokyo-Mitsubishi UFJ, Mizuho Bank, and TD Securities are major lenders of the project. Currently, Dakota Access can only withdraw $1.1 billion from these lenders until certain government permits are issued.